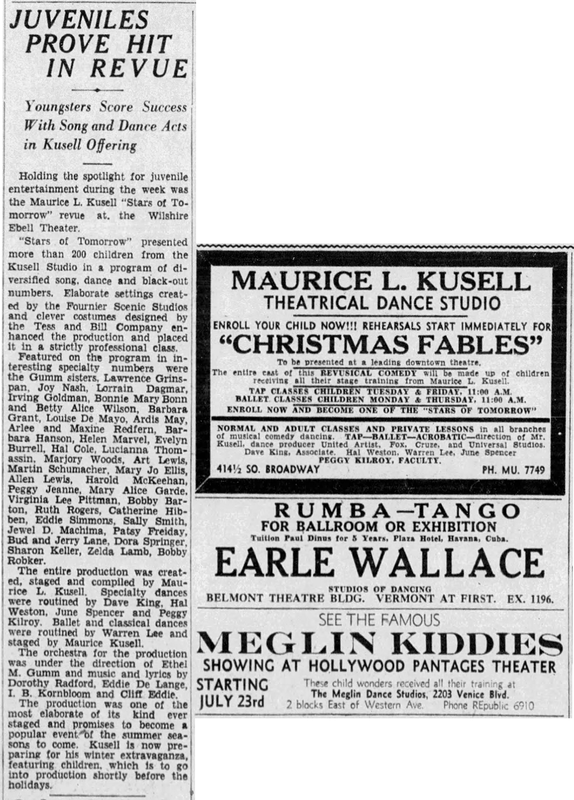 July 19, 1931: “The Gumm Sisters” were listed at the top of the list of performers who received this positive review for their part in Maurice Kusell’s “Stars of Tomorrow” which ran from July 10 through July 17 at the Wilshire-Ebell Theater in Los Angeles. July 19, 1934: This photo was allegedly taken of Judy on this date, in performance at the “A Century of Progress” exhibition space at the Chicago World’s Fair. 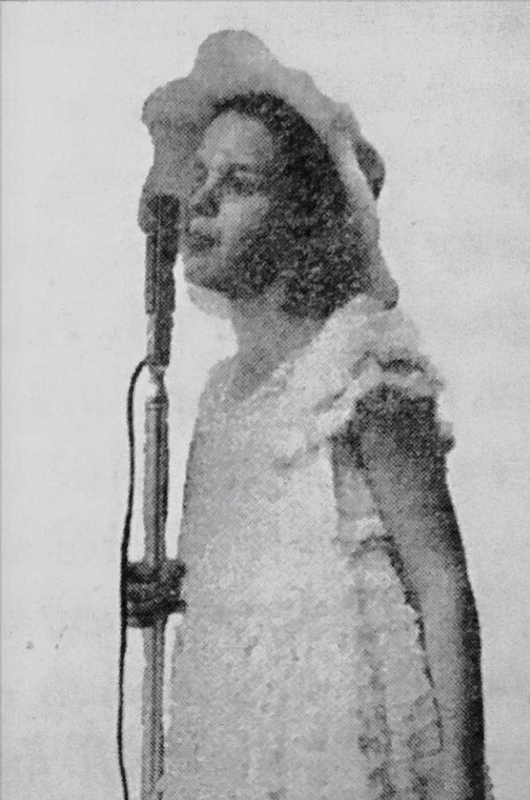 Frances (Judy) was selected as the guest of honor and star performer for the “Eighth Children’s Day” event. 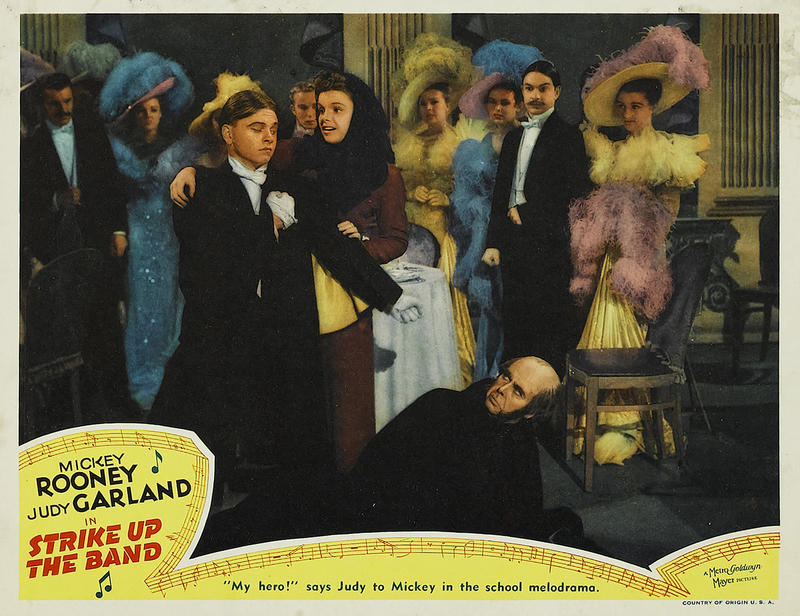 July 19, 1940: Strike Up The Band filming continued with retakes on the “Gay Nineties” number and on the “Interior Gym” set. Time called: 9 a.m.; dismissed: 12:15 p.m.
Judy and Keaton would work together eight years later when they made In The Good Old Summertime. It was Keaton’s last film for MGM. Also on this day, at MGM, Judy did not report to work on Babes on Broadway. 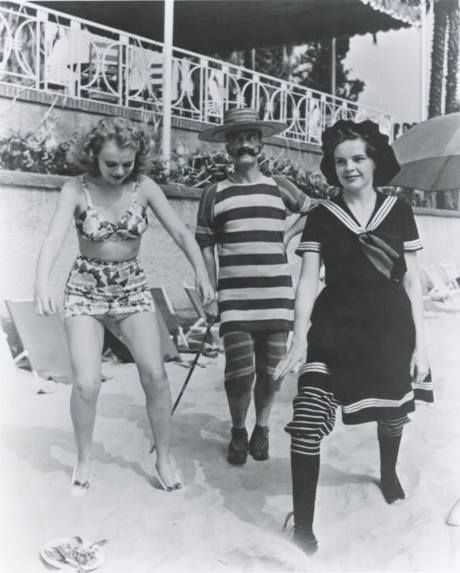 The assistant director’s notes state that Judy Garland was called for wardrobe fitting at 1:00 p.m. today and to come to rehearsal at 1:30 p.m. on stage 8. At 1:05 p.m. she arrived on lot; at 1:35 p.m. – when Miss Garland did not go to stage 8 for rehearsal – Her home was called and a message left for Miss Garland to call company on stage 4 when she arrived home – after not hearing from her by 6:30 p.m. Mr. Ryan called to give her call for Monday, and she had not yet arrived home. 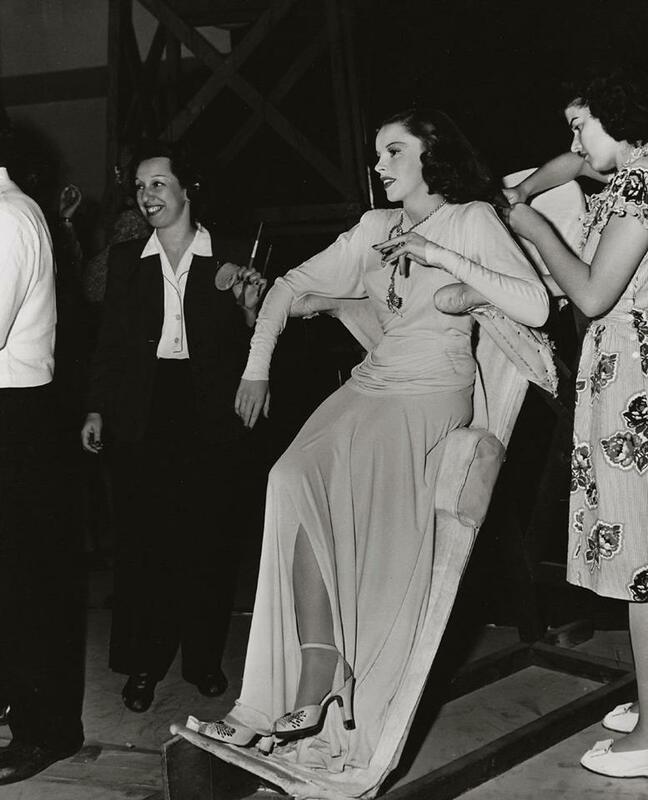 July 19, 1944: The first day of filming “A Great Lady Has ‘An Interview'” for “Ziegfeld Follies on MGM’s Stage 21. The number was directed by Vincente Minnelli. Time called: 9 a.m.; dismissed: 6:10 p.m. 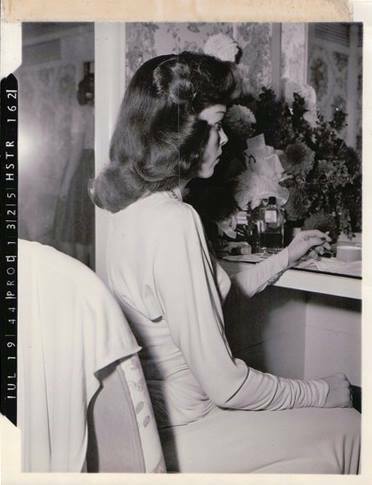 These photos of Judy were taken on this date. 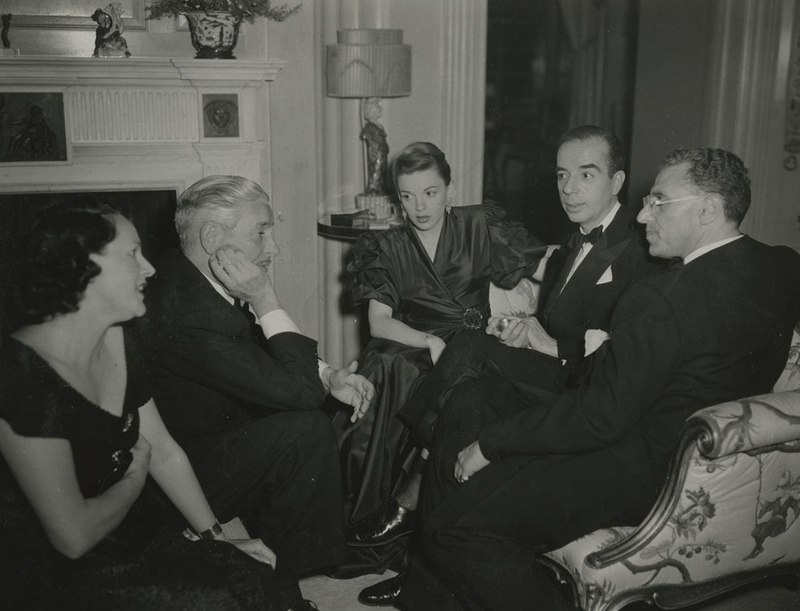 Circa 1947: Here is a great photo of Judy and husband Vincente Minnelli chatting with director George Cukor and two others during what looks like a house party. The exact date is unknown. Thanks to Luanne, the other two folks are identified as Ronald Colman (without hair dye!) and his wife Benita Hume. 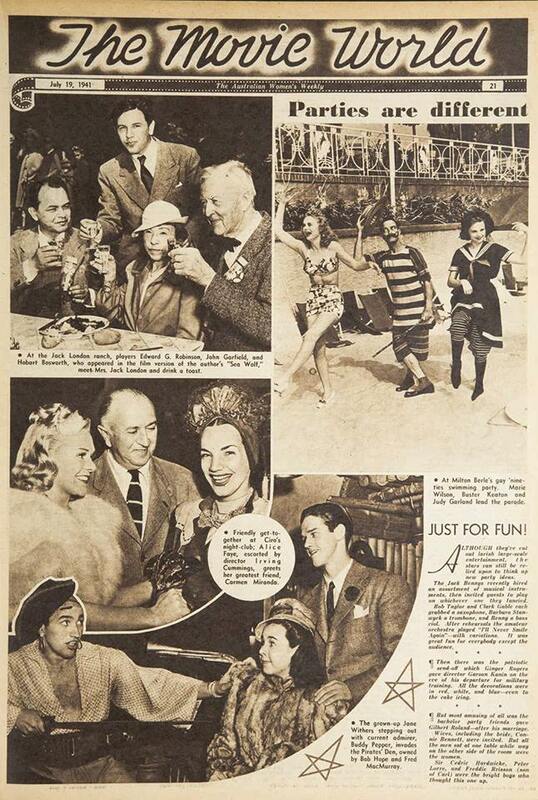 July 19, 1953: This spread appeared in quite a lot of papers around the country, part of the Sunday “Parade” section. 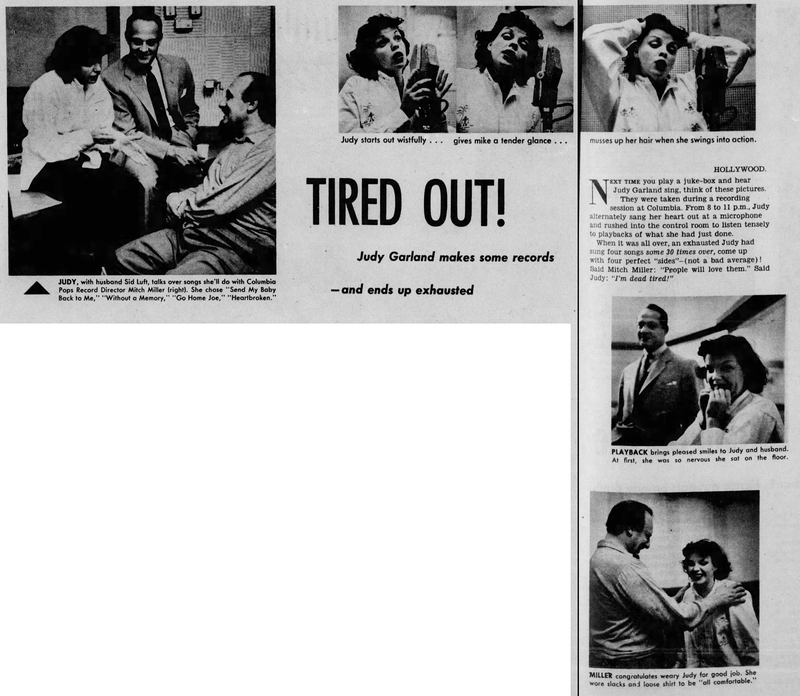 It features some great photos of Judy with husband Sid Luft and Columbia Records’ Mitch Miller, taken during Judy’s sessions for the label (on April 3rd) during which she recorded four singles: “Send My Baby Back To Me”; “Without A Memory”; “Go Home, Joe”; and “Heartbroken.” The label also released the soundtrack to A Star Is Born in 1954 but by that point, Judy’s contract had expired and she moved to Capitol Records in 1955. 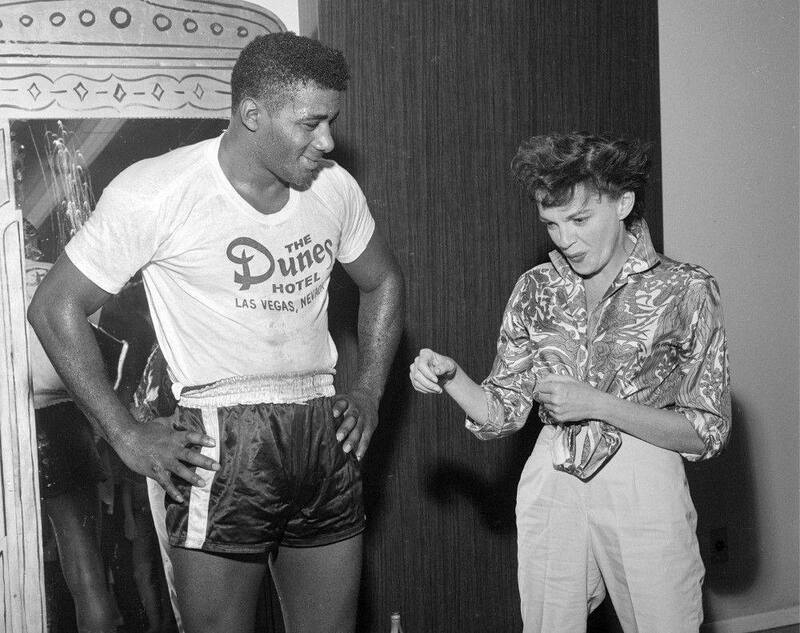 July 19, 1954: More filming of the “Melancholy Baby” number for A Star Is Born on the “Interior Third Nightclub” set. Time started: 5 p.m.; finished: 12:55 a.m. Check out The Judy Room’s Extensive Spotlight on A Star Is Born at here. 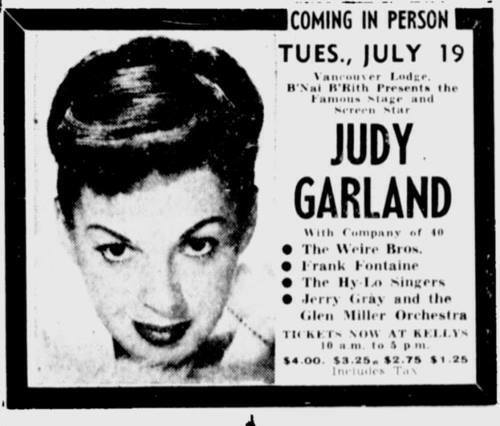 July 19, 1955: Judy was in concert at the Exhibition Forum in Vancouver, British Columbia, Canada. 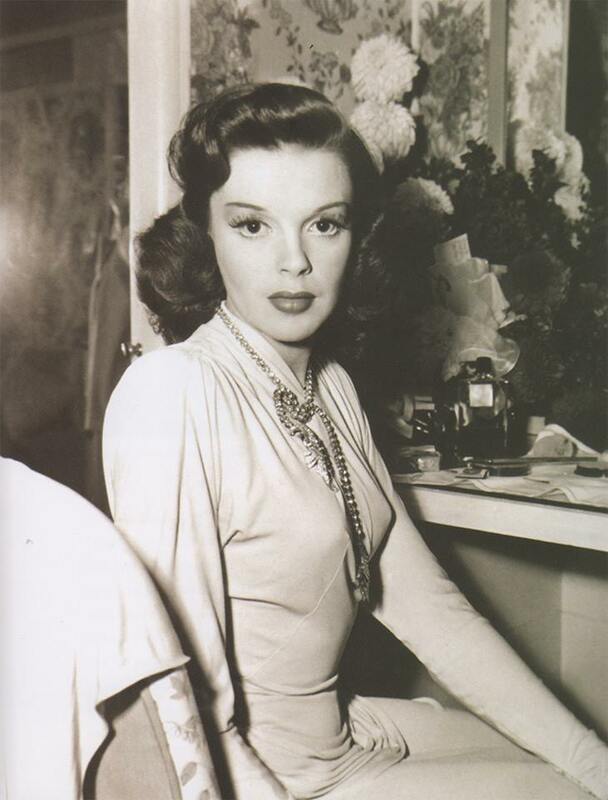 The show was a huge success, but afterwards, Judy’s husband and tour producer, Sid Luft, canceled the rest of the tour by citing a clause in the contract that stated Judy could cancel the dates without repercussions if she was needed for film or television work. The result was Judy’s first TV special which aired on September 24, 1955, not long after Judy signed a recording contract with Capitol Records that August. 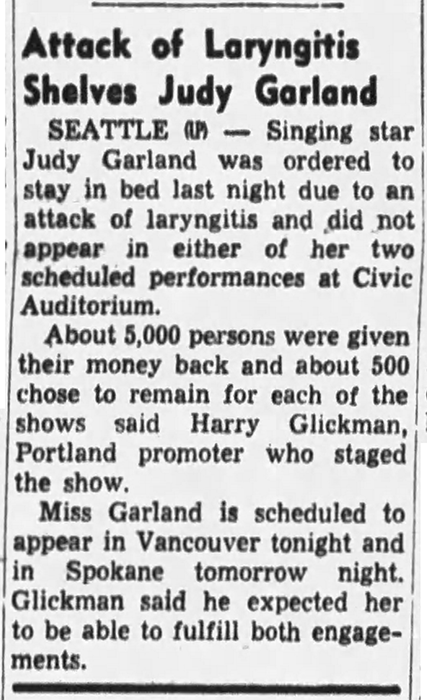 Just prior to this Vancouver engagement, Luft had canceled Judy’s two shows in Seattle scheduled for July 17th & 18th, citing that Judy had laryngitis. 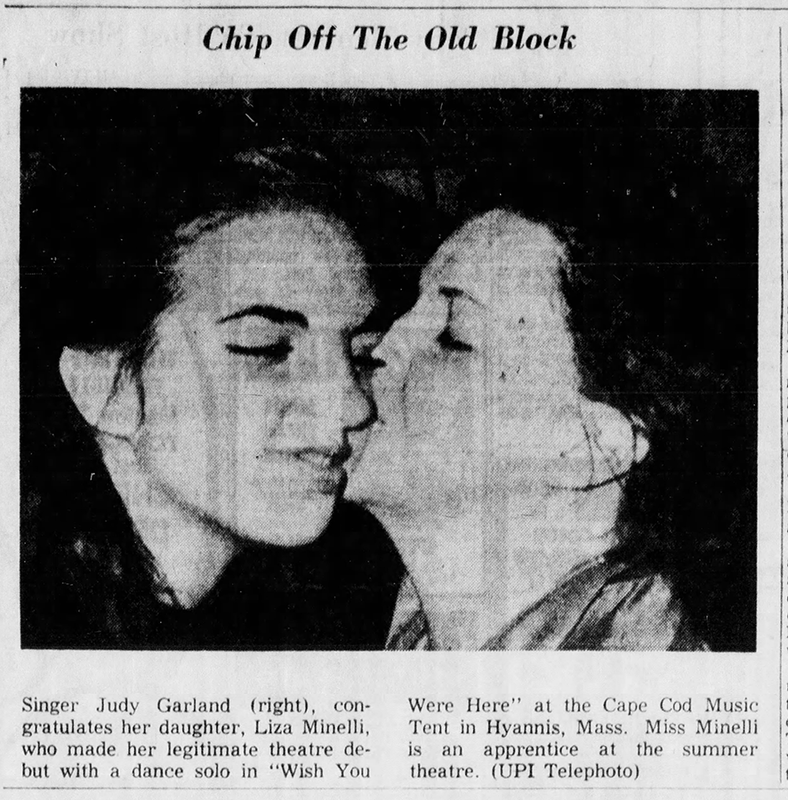 July 19, 1961: Here is a photo of Judy congratulating daughter Liza Minnelli on her legitimate theatre debut in “Wish You Were Here” at the Cape Cod Music Tent in Hyannis, Massachusetts. Judy and her family were spending the summer near the Kennedy compounds in Hyannisport (Judy and JFK were friends). In one article, Judy joked that they were just a short 100 feet from the Kennedy compound. July 19, 1963: Judy took a break from rehearsals for “Episode Four” of “The Judy Garland Show” to zip over to Las Vegas. 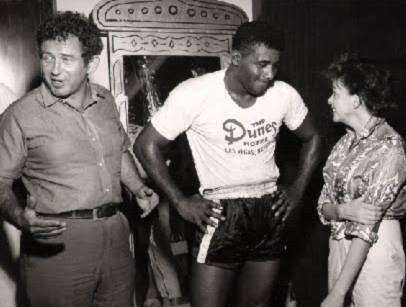 Here she’s seen clowning around with boxer Floyd Patterson, and with author/playwright Norman Mailer. July 19, 1968: Judy was supposed to be in concert on this night at the J.F.K. Stadium in Philadelphia, Pennsylvania. However, the show was rained out and pushed to the 20th. Here is a ticket for the 19th, which I’m sure was good for the show on the 20th. July 19, 1969: Don’t mess with Garland fans! Larry Lowenstein of Long Branch, New Jersey, objected to the July 3rd column by Paul Van Duren in which Van Duren was less than sympathetic. Here is the letter to the editor as well the original article. 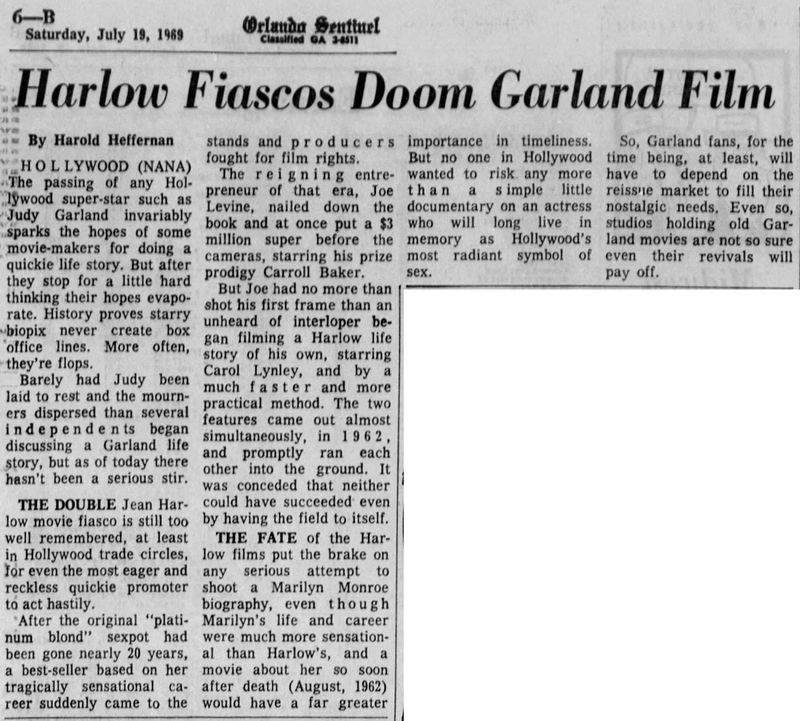 Also on July 19, 1969: This article explains why there would most likely not be a Garland film biography anytime soon. The two other people in the house party photo are Ronald Colman (without hair dye) and his wife Benita Hume. Thank you so much! And wow, I didn’t recognize Coleman at all, he’s one of my favs. In later years George Cukor was rather waspish in his comments about Minnelli and his films.